Becca and Brian's Grand Adventure: Run Like Hell... Feel Like Hell! Run Like Hell... Feel Like Hell! After running Pints to Pasta with Becca, I got in my mind the idea to run a half marathon. I wasn't really sure on how to properly train for it, so using the power of the Google, I found a training plan, a race and realized I had 6 weeks to train. Thankfully excluding the track intervals, I'd done the work to date. The six weeks went pretty well. The big adjustment was two fold; I moved from running 4x to 5x a week and I spent one of those days doing intervals at the track. The reason I quit running in the first place was because I hated running on the track so much. Thankfully this particular program only had you doing it once every two weeks which was about my limit. Still, I was pleased by the speed and endurance I was showing. After part of picking up my race packet yesterday, Becca and I decided to drive the course. It being Oregon, it was POURING. As we drove through massive puddles I started to get a bad feeling about the race. The weather was supposed to be more of the same today. Obviously cold, wet weather is not conducive to fast times. Then there was the actual course. 5 flat miles followed by 4 miles of steady climbing, then 3 miles of steep ups and downs and a mile flat at the finish. Not exactly a course built for speed. The more we drove it, the worse it looked. After completely psyching myself out, we went home, laid low and I took in the Ducks crushing University of Washington as well as the Red Sox forcing a Game 7. Considering this a good double dish of karma, I got to bed nice and early, nervous but excited for race day. 1) Run the first 5 miles comfortably fast and built a time cushion. 2) Run the 4 miles uphill with a goal of minimizing how much time I gave back. 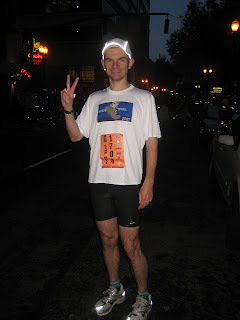 3) Let 'er rip the last four miles and hope I don't burn up. Line for the porta potties? What line? Race Day started off with a very good thing: stars. Clouds were nonexistent outside of our house, allowing us a clear look at the early morning stars. In short, no rain! We packed up my stuff and headed downtown to the start. I warmed up a bit, kissed Becca good luck and then got into the starting chute. When I start races, I like to get around people that look to be about my speed. I looked around and realized that large packs of chatty women with iPods (no offense to said running subset) were my neighbors, I weaved my way up to a reasonable spot for the start. With that I was off. I weaved my way though a few people and got into a steady groove. Passed Becca a mile or so in knowing that I'd see her again in a few miles (the race started with a small loop). Mile one was a 6:49 pace. Comfortable and a good start. Hitting mile two, I started to get worried. My watch said it was a 7:12 pace and I couldn't get warm. If I was losing time already and didn't feel right, what was my chance of being able to actually break 1:30? This was a real dilemma for me; I felt blah physically and mentally I was a mess. I even contemplating dropping out (something I NEVER do). I decided to see what my mile 3 time was before making any rash decisions. Of course, there was no mile 3 marker so I kept going to mile 4. The first words out of Becca's mouth when she saw me were "you're running too fast!". 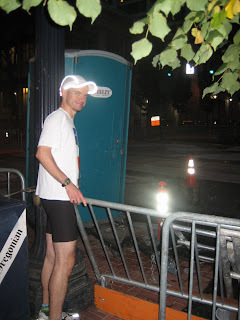 I hit the marker and realized that the mile 2 marker must have been WAY off. Suddenly I was going too fast. With almost 90 seconds in the bank, I elected to relax again and just settle into a good stride. The hill portion was a challenge. 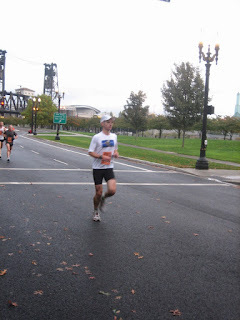 Most of it was just a steady climb so I focused on keeping a decent pace and keeping up with my fellow runners. Fortunately I was part of a three man pack who was pretty content just working together up the hill, passing a few folks along the way. It made it a much more manageable experience and allowed us to focus on something other than the never ending incline. After the four miles, I still had just over 40 seconds in the bank. Having this 40 seconds in the tank after the hardest part of the course was like a get out of jail free card. Time to let 'er rip. Of course, the previous three man pack had separated; one was about 30m in front of me and the other one was quickly dropping off the back. So for the next four miles, my place didn't change. 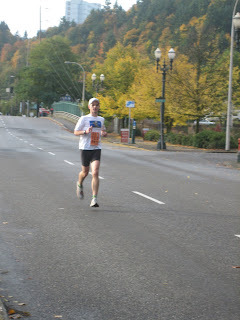 I followed a line of three runners that were 30-50m ahead of me down the hill all the way to the finish line. I'd like to think I could have caught at least one of them but I kept running hard and couldn't make up any ground. Of course, when your last two miles (partially downhill) are 5:48 & 5:47, you can't feel too bad about not gaining any ground. I do credit Becca's inspirational "Run Faster!" as proper motivation though when I started to falter a bit with a half mile to go. Approaching mile 12 looking good and what is the wife yelling? 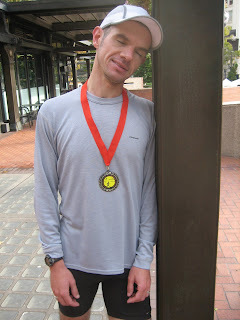 I gave what little I had left in the tank at the finish line and was shocked: 1:25:07! Needless to say I met my goals with a flourish. (And me being me, I immediately was mad that I hadn't run 8 seconds faster and broken 1:25.) I finished 23rd overall and despite some very tired legs, I actually feel pretty good. Met Becca post-race, warmed down, enjoyed a Winterhook and then headed home. In fact I'm writing this with my feet propped up, a beer close by and taking in a day full of football to be followed by Red Sox/Indians Game 7. Don't let the pose fool you. Brian actually was pretty bouncy post-race. So in short: Brian run fast. :-) Becca = superstar wife for putting up with my training and pre-race nerves and Red Sox in 7.
additional notes from the support vehicle and photographer: after driving the course yesterday in the monsoon we were both pretty psyched out about it and worried that the 1:30 goal might not be that realistic. However the vastly improved weather this morning definitely relaxed us a little and Brian seemed in good spirits when I left him at the start and went out to stake out my first cheering location. When I saw him several minutes early at mile 4 I got worried again that he might blow up on the hill, as he was running more aggressive than his pre-race plan had dictated. Have a look at this site and its accompanying podcast for inspiration !